We’re kicking off Beta this week with a few invites. As I said in my last post, we’ll be ramping up slowly so don’t worry if you didn’t get an invite yet – your turn will come. If you are lucky enough to get in, I’ve set up some new forums to discuss your thoughts and report bugs. As an early tester, you’re likely to run into a few rough edges and problems – feel free to let us know about them! See you in the game and happy Beta testing! Awesome, I cannot wait. This game looks like it’s going to be a lot of fun! Does this mean those of us who see the forum = we’ve got invited, or it’s visible to all just to make the rest of us drool with jealousy? Sweet, can’t wait to get an invite!! The forum is visible to everyone, because it seemed like too much work to make it hidden. This will be the only BB card game that i will ever pay and stick with it. oh man finally! Who do I have to bribe to get in now? I am your (hu)MAN … and dwarf/elf/gnoll/orc/undead for the beta! My fingers, they’re crossed soooooo hard now, you don’t even know! Come at me bro… with the invite of course ehe. I sure hope I get in. I applied a long time ago. ADRENALINE RUSH FROM READING BLOG TITLE!!!!!!!…….. and i can breathe again. It’s coming! IT’S COMING! Btw, if I may ask, how much people will be chosen? It’s coming! IT’S COMING! Btw, if I may ask, how manhy people will be chosen? It’s coming! IT’S COMING! Btw, if I may ask, how many people will be chosen? No professional bug reporting tool? For me reporting bugs in a forum without a template is most times not good enough for proper bug fixing. Awrsome, beta, one more step to glory. @BigSmurf – You might be right. If that turns out to be a problem we’ll definitely shift our focus to it. Since Card Hunter is an online game we log a lot of server stuff and can wade through that to diagnose some problems. I also added a feature a couple of days ago that automatically sends error reports from the client to the server, so we can get a lot out of those too. Anyhow, we’ll see how we go and course-correct as appropriate. Cool I cant wait for an invite. Yeaahaa! Can´t wait to finallz play it. Cannot wait till I get my invitation. This is going to be amazing game! And cue everybody checking their emails 20 times more than usual! Man oh man, I’m sitting here wondering at how many invites will go out and if I’ll even be among them! Time to pray to the dice gods! Will it be possible to pay a amount of money to get into beta? because this is one of the games that I really wanted to play this year and I would be willing to pay for beta access. I’m totally stoked to play! Remember, I’m ready to donate a kidney if need be for an invite. Awesome news been waiting way to long for this!!!!!!! card + board + rpg game in one? it’s like heaven on earth! I signed up along time ago too…. Can’t wait! Don’t forget me! I’ve bin waiting for so long! So awesome to see the beta coming up! I hope so bad, that I get a beta-key! I don’t have my invite yet. I’m pretty sure there has been some huge mistake. I have been visiting this website for over a year now. Frankly the psychic connection should be made and I should have an invite. To be honest, the lack of service given to those trying to sign up for beta by willpower alone is shocking. Added my “e-mail” now… I GUESS. Yay ive been waiting for this! I am so glad you guys are moving forward so quickly! Will continue to wait patiently, but I hope some of those early Beta testers are nice to us when we get invite. Guess it’s only been 9 days… seems like FOREVER and still no beta for me. 😉 Wow I sound like a whiny fanboy. *shrug* maybe I am for the first time ever. Come on Beta!!! Good cardboard gods, there aren’t even any beta-keys available on Ebay. … not that I checked, of course. I wouldn’t do that. No, sir. ….. when’s the next round of invites? Can’t wait until you get around to inviting me. I’d started to flounder in confidence if you were still working on the game or not. 2013, for a change, has to start good. So you have to pick me. Soon. Or my head will explode. Can’t wait to play Card hunter! Looks awesome! I’ve been following it for about a year now and I’m about to have a spasm. Don’t mind waiting a long time for something good and you can see a whole lot of hard work has gone into this. Can’t wait for this game. Hoping to get into Beta, but will be getting this game regardless when it is released. Darn it! Jan 18 was my birthday and I didn’t get a key! Worst. Birthday. Ever! Can someone point to an already released isometric turn-based CCG tactical rpg with fleshed out campaigns and PvP? Still waiting. I’ve tried to wait patiently. But I just feel that I have to remind you. Just a reminder! That I’m still waiting! 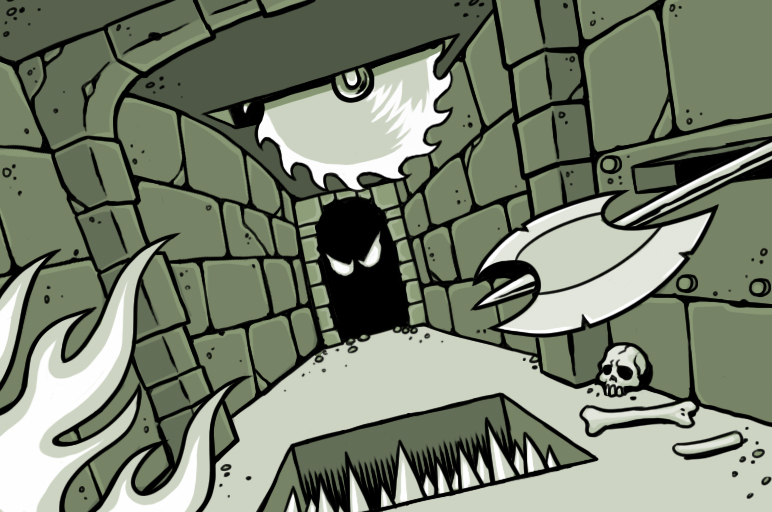 Ok so the art for this post just totally reminds me of Grimtooth’s traps. LOVE IT!! Ah the joys of slapping a PC with a well crafted Grimtooth trap…… *wipes small tear from eye* ….. Thanks for wonderful memories! Can i get a beta please?!?!!?! Will we get an update soon? It’s more than a month since the last one. Heya! Just wondering how long does it take to get an invite to the Beta; I’ve been waiting since about 2 weeks ago; which means there must be thousands of people waiting to play – they are adding 300 a day to the invite list (at least 4200 more). Maybe I should ask, how many people are on the waiting list?